NEW DEADLINES: Used to be at least a couple of hours, not it's half an hour and they have to be sent beyond the newsroom goons. 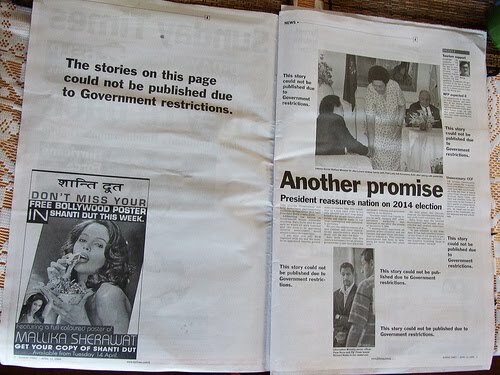 In case there is doubt out there about the censorship of Fiji media, this was sent to media outlets this morning. You are hereby requested to send in all news headlines to mediamonitor@info.gov.fj at least half an hour before it is aired. This will enable us to effectively monitor the coverage for each day. Obviously a ploy to control the media, especially radio (who some say had it easy) even more. The new protocol comes as the dictatorship tries to break the Methodist Church. Not satisfied with cancelling the three-day conference, the regime has tried to sow the seeds of discontent between leaders by playing up 'divisions', despite them trying to keep them in perspective. It fanned the 'reconcialiation' story and has fed info to the church that Indian members are acting as secret squirrels for the regime. The stewards got the better of them, though, when they managed to 'meet' and endorse Ame Tugaue and Tuikilakila Waqaraitu. Bloggers following the Fiji media coverage (and that of some of the naive international news teams), will have been reading between the lines to get the real story. 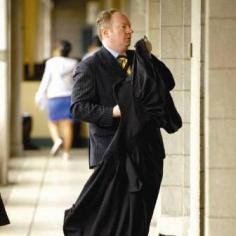 GETTING HIS COAT: And returning to Fiji? Dated today, it says the Fiji Court Judge, Justice Daniel Goundar has been appointed the acting chief justice from August 22 to September 14, 2011. To be expected, the announcement was made by Frank Bainimarama's handler, Aiyaz Sayed-Khaiyum, who was quoted as saying "Chief Justice Anthony Gates is taking his annual leave." Scpetics have already contacted Coupfourpointfive to say they have been told Gates has left permanently. We can't verify that but as they say in the news business 'truth will out' eventually. Editor's Note: It looks like MINFO censors backed off the new rules. We've been advised it sent the following email retracting AND apologising for the earlier email at about 4.55pm this evening. Please ignore previous email regarding the emailing of all news headlines to mediamonitor@info.gov.fj half an hour before it is aired. Any inconvenience caused is regretted. another jhuran baigun sala rotia asli mai chood. he urgently needs treatment from revolutionary group. 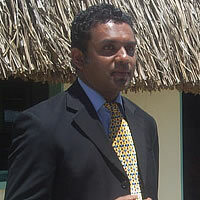 Goundar - enjoy your 30seconds of fame - don't ever forget what you did to the Qaranivalu - we have'nt. What evidence did he go by to justify his overuling the jury? WHY IS THE APPEAL HOT HEARD YET? WHERE IS MAHENS CASE? HAS HE BOUGHT OFF THE RIGHT BOYS WITH DONATIONS TO THE POOR HE POCKETED? Frank Bainimarama, I hope you're watching very carefully this blog. Your time is almost up. What will you do when they come for you and your family of crooks? Run like Gates! Aiyarse and the red head and all other illegal junta supporters. Your time is up. Get ready for Judgement Day. I hope you like prison food! Q: How dumb is Frank? A: When he finds himself lost in thought, it's unfamiliar territory! goundar sala chor,used to copy assignment is uni..
what a jokke,chief justice.. this can only happen in fiji. rats are jumping the sinking ship. seems the fat rats will jump first while the raft is available..
goundar, dont forget your 'garibi' in labasa..
so who will be next, sharon? Anon. @6:49 PM. WHY IS THE APPEAL HOT HEARD YET? Sources tell me it is being heard on the 30th of August (Tue). They also tell me that FIKOOKOO was against Judge Marshall sitting on the bench to hear the appeal. So they tried to make-up lies about Mrs. Patel and say they know each other well and have been seen talking at the Holiday Inn Suva. Who are these kids, who are these imbeciles to decide what I want to read, the infidels!! I see the arrogance has certainly rubbed off on a LOT of people!! One day, One Day Mafato!!!!! But you gotta wonder why they heck they would think of imposing it in the first place? This week's Methodist Conference...? VRF? As has been said about the Tripolic compound of Gaddafi, the wals have been breached - get over it! Goundar sala chor madarsi.....got the sangam people to give wife a job at sangam suva high school...corrupt bastrad madar chod. Leaked US embassy cables are revealing a potentially different side to the Government’s views on Fiji and its military regime. Publicly the Government has said it’s hopeful of a return to democracy there but has generally avoided making potentially controversial assessments about the chances of elections occurring in 2014 as scheduled. However a US Embassy cable from February 2009 reveals foreign Minister Murray McCully told the Americans that Commodore Bainimarama had no interest in moving towards democracy or stepping down from his leadership position. Mr McCully’s quoted as saying the commodore had settled in for the long haul. There is no election in 2014.
Who will vote for this junta and its dictator? The people 800000 must do people power revolution and free fiji from the crimes and hostage taking by the junta. All these junta thugs, its hand puppet, dictator pisspot presidnet must stand trial. A citizen arrest is needed by the 800000 people of the dozen junta thugs. Time is up time for revolution on the PER cowards. GET READY VRF TO HANG YOU ALL IN ALBERT PARK. WE WILL GIVE OUR SUPPORT TO YOU ALL IN FIJI/VRF./UNION/CHURCH/SDL/FLP SHOULD BE UNITED TO FIGHT THE REGIME..
Yep, there will NO International Court Of Justice for this thug and his lot. Only human beings are given that privilege. These people are the scum of this earth. They will be tried by the iTaukei courts and people!! How I would love to preside over their case!! Be prepared Vore and you Arse!!!! the VRF alias the "ghosts who walks" must be very careful not to get caught. Justice gates has done a runner...Smells bad in next few weeks. Pride too will run for cover apparently urgent leave. Then Frank and Aiaz will go on overseas trip and this time the final time will take their famalies and stay back like Roko Lui. Then no extradition will bring them back to Fiji. Your plan and challenge is now seeing day of light. its good to hear that pryde is gone. To Kalpanna and Qiloani - watch you r backsides. We will be shadowing you both from now on - where you have lunch, where you go clubbing, you EVERY moves. WE know where you both live - so, be careful. If we will, then we will just have to - know what we mean????? Funny how it was AG's bodyguard that saw Mrs Patel shake hands with Marshall. Smells fishy. looks like someone is trying stitch up mrs Patel and put her in jail as well. I am always surprised that individuals both here and abroad, accept the lie that there will be elections come 2014!! Let me tell one and sundry, locally and abroad - "THERE WILL BE NO ELECTIONS AS LONG AS THEY ARE ALIVE"!!!! Let's stop lying to ourselves, face the facts, accept the realty of life in Fiji - Brace yourselves, THERE WILL BE NO ELECTIONS!! Wasn't there a bounty put on the illegal PM and AG a while back? Was it "dead or alive" and is it still on offer? Gates and Pryde must be hunted down. The future of Fiji and in particular its children, must be safe. do the right thing,you may become the legal chief justice. I'm confused. Is Goundar replacing Gates as Chief Justice? Or Pryde as Solicitor General? AIYAZ you were given an amazing opportunity to showcase your talent and you came up with this????? Bring it on Khaiyum and Bai. If you are still there in 2014....bring it on. My brothers, sisters and I are already campaigning. We've got you covered. If you think that this is a side show to derail us from concentrating.......NAHI, SEGAI, E WARA......we the VRF will be there tomorrow, 2012, 2013, 2014.....come what may. We've got you sussed. YOU LIER. (and you wonder why we mispelt the word liar) Now that we've got your attention. Chaloooo!!!! And when you leave make sure the millions are hidden away so nicely that the contractors jobs ar finished and gone or they will be taken to task. All works will halt on contract pricing to check if this is not another Suncourt like hiped up charges. Intel sources have revealed that former Chief Justice SIR TIKARAM, a close friend of Motibhai, has been BANNED by the coward regime from going to court for Motibhai's Appeals Hearing on the 30th of August (Tue), because of his 'overbearing' and 'intimidating' presence. aiyaz does not like any competition. with goundars big mouth that ag will be charged by ficac,his time is near. JUDGE MARSHALL was AG's supervisor of his thesis : sunset clause while doing his masters in Hong Kong. So you can see AG gave him the job, therefore, judge Marshall is AG'S PUPPET. He would do anything even lie.So if you reading this Motibhai's family Mrs Patel meeting Judge Marshall is a big lie and a setup..dont believe it..!! AG YOU ARE RUNNING OUT OF LIE , SO THINK TWICE BEFORE YOU WANNA LIE..O NA MOKU , LASU LASU!! VUAKA!! Remember when we had good Judges, Magistrates-now we moan & groan-bale vei cei? Be quick people don't let any of these people run out of Fiji.they have to be jailed for their actions.we have to sell all their assets and get back our stolen tax monies they stole from us so we can at least educate our children..please remember their names.....bainimarama ulukau khayumshameem sisters driti Mara pryde teleni khiyums bro nur bano big chor bole kubuaba rabuka etc etc etc etc . Oi, MINFO the whole world watching you work your propaganda.